Many residents who are experiencing tough financial times and searching for debt relief options are considering a wide variety of debt relief programs, in addition to personal bankruptcy. Like so many others across the country, many residents of Arizona find themselves in over their heads and need assistance to help with managing, reducing or paying off debts from credit cards and unsecured debts like utilities, department store charges, or medical bills. Luckily, there are debt relief options or "solutions" that may allow you to lower your payments, reduce debts, save money, and get out of debt at an accelerated pace. These debt relief options typically include debt consolidation, debt management via credit counseling, debt settlement, or even bankruptcy. Also known as a "debt management plan" or DMP, debt consolidation is coordinated with the help of a debt counselor or credit counselor. Debt consolidation typically can help consumers with high interest debts spread across multiple credit cards by combining or "consolidating" those debts into a single, more workable payment plan made to a credit counseling agency. The goal of a debt management plan is for the counselors, working on behalf of consumers, to conduct brief interviews with consumers to get a good understanding of their existing debt load and the amount of money consumers can reasonably afford each month to pay down their debts on a predetermined schedule. One by one, creditors are then contacted by credit counselors requesting that they accept proposals to extend the benefits of debt relief to consumers who are experiencing a financial hardship. These benefits may include lower interest rates, a waiving of late fees and penalties, and even monthly payments they are more affordable. The good news is, when consumers stop racking up new credit card charges and begin to pay down debts month after month on a set schedule, and at lower interest rates, the process of debt resolution and paying off the principal amount of debt becomes predictable – and even exciting for consumers who are used to spiraling debt being a sad fact of life! Debt management plans can be very effective and save a substantial amount of money if followed faithfully. 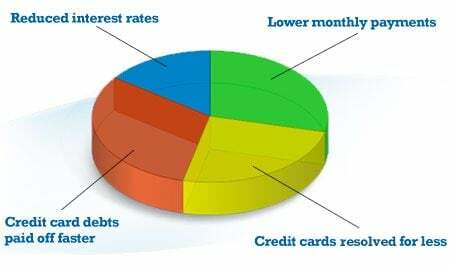 Although they do not make debts magically go away, they are an honorable way for consumers to get out of debt on a predictable path and live up to their financial obligations as promised. If you are considering debt consolidation or a debt management plan coordinated with the help of a credit or debt relief counselor, take a moment to find out how debt plans may be able to help you resolve debts faster. Get your free debt relief evaluation and savings estimate. Debt settlement or debt negotiation may be a reasonable debt relief alternative to bankruptcy for many consumers who are truly unable to meet their financial obligations or have very high balances on their credit cards. While the goal of debt consolidation or debt management is to payoff the full amount of multiple high interest debts, just at a lower interest rate and via one consolidated monthly payment; the goal of debt settlement is to negotiate with creditors in hopes that they will agree to accept a reduced amount compared to what was originally owed. Debt settlement or debt negotiation can offer an honorable strategy for many consumers to pay back a portion of the debts without declaring bankruptcy, and potentially save a substantial amount of money in the process. Although the opportunity to save a substantial amount of money with debt settlement, it's important to remember that there can also be drawbacks to this form of debt relief. It's common for your credit score to be impacted negatively because when you when you enroll in a debt settlement program and settle your debts, it usually involves "falling behind" on your monthly credit card payments in order to redirect the funds to build up a settlement offer for a creditor. In addition, as you fall behind in making payments, creditors may threaten, or take, legal action as you are not living up to the terms of your credit card agreements. Finally, it is important to understand that while debt settlement has become increasingly popular because it can help consumers save a substantial amount of money, the money saved through debt settlement is subject to federal taxes. If you are struggling with credit cards and in need of debt relief, find out how structured debt relief plans could help you save money and resolve debts faster. Get your free debt relief evaluation and savings estimate. You might be wondering why credit card companies would be willing to settle with consumers for less than the full amount owed. For consumers who fall behind in payments by 90 to 120 days or more, credit card companies may often "sell off" what is considered "bad debt" to a third party collector for as little as 10 cents on the dollar, so it is not surprising that creditors may be willing to accept a reasonable settlement offer from consumers rather than get little or nothing if the debt is "sold off" or the consumer is going through such a financial hardship that they file for personal bankruptcy. The good news for consumers is that even though debt settlement will typically have a negative impact on credit, it is not as serious or long lasting as a personal bankruptcy. If you are struggling with credit cards or other unsecured debts or going through a financial hardship and need to review your debt relief options, you can request a free debt relief evaluation and savings estimate today. Many residents may require assistance beyond debt relief programs for more immediate relief, such as help paying for utilities, rent or even buying groceries. To help low-income individuals and families with children, the state of Arizona has a variety of financial assistance programs available, such as the Food Assistance Program (SNAP), Medicaid, and the Low-Income Home Energy Assistance Program (LIHEAP). To learn more about these services, go to the state's homepage and click on the Benefits page. Are You Experiencing a Financial Hardship and Need Relief? It's important to be aware that debt relief programs are all designed to help consumers who are truly experiencing a financial hardship, whether you're seeking debt consolidation coordinated by a credit counselor, or debt settlement using the services of a debt negotiator. Debt relief programs are not for individuals who are financially fit and able but simply want to walk away from debts and ignore the terms of their original cardholder agreements. Just as the option of personal bankruptcy was overused by some consumers on multiple occasions until the "bankruptcy means test" was put into effect to end this practice – there are financially capable consumers who choose to take advantage of debt relief programs that are designed to provide a lifeline for individuals and families going through a financial hardship. 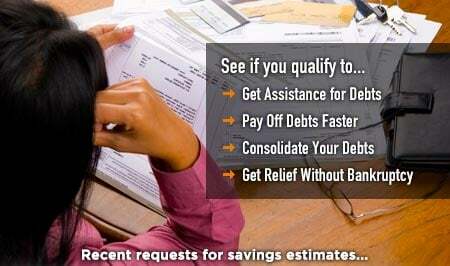 If you are in need of relief from credit card debts, or other unsecured debts, take a moment to request your free debt relief evaluation and savings estimate today.